Citizen science is a powerful tool for environmental management that has the potential to inform an increasingly complex environmental policy landscape and to meet the growing demands from society for more participatory decision-making. However, the evidence that Citizen science can successfully contribute to environmental policy development, implementation, evaluation or compliance remains scant. 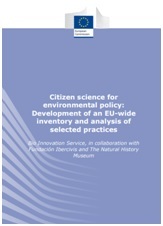 In this sense, the aim of this study was to provide the European Commission with an evidence base of citizen science activities that can support environmental policies in the European Union (EU). Develop policy recommendations on better integration of citizen science in the different phases of the environmental policy cycle, in particular for monitoring, reporting and regulatory compliance. Citizen science can underpin environmental policy. Environmental SDGs are unevenly represented by the environmental citizen science. Government support favours policy uptake. Facilitating citizen engagement promotes policy uptake. Scientific excellence increases the extent of policy use. NGOs are key actors of environmental citizen science. Policy use rests on the availability of sustainable business-models. 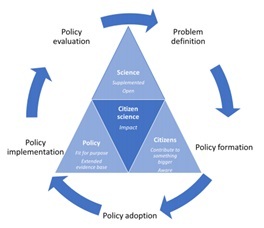 A continuum of citizen science approaches to support policy. “The role of science in policy-making has changed over time, and coproduction of knowledge by technical experts and members of the public is likely to be very important in future decision-making and can help develop trust”.